Posted: Tue Dec 21, 2004 10:47 am Post subject: Oooh! A complaint! 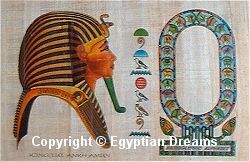 I would just like (as a joke) to state my outrage at the ridiculous 'cartouche makers' being sold in the Egyptian Dreams shop. They are advertised as being great for children, and yet they instruct them in false hieroglyphs! The hieroglyphs in the sets are just direct transliterations of the Greek names and are completely wrong! See for yourselves'! "Tut-ankh Amun, Nesu heka Iunu"
The rest of them are all like that. Cleopatra's one is wrong, Nefertiti's is wrong. . . I have yet to find one genuine cartouche. Just think of all of those children misspelling the names! Oh- it makes me sick people. You should be ashamed of yourselves! Just kidding. I just found that mildly amusing. If you notice the actual cartouche is left blank! They come with a set of stickers that contain hieroglyphic symbols so that you can put your own name inside the cartouche. I don't think there were many ancient Egyptians with the same names as we have today so what hieroglyphics are we supposed to use? I'm not talking about the stickers- I am talking about the false transliteration, or indeed spelling, of the Egyptian's name to the left of the cartouche. I believe that you are mistaken- the figure on the papyrus is most certainly Isis, not Hathor. She wears the Isis/Hathor headress, but can be identified by the correct central inscription, "Words said by Isis....". I'm pretty sure that is Hathor becuase she wears a necklace that only Hathor wears, can't remember what it's called but it's usually Hathor's associated with it. There is another picture which also gets confusing. it's a picture of a queen being led by a horned goddess. Now, many people say it's Hathor but I'm pretty sure it's Isis, because the throne symbol that is her name is in the hieroglyphs next to her. Those two goddesses are so alike it's almost migraine-inducing i'm surprised they don't have a rivalry between them! Egyptian Dreams has good stuff in its gift shop, and the products are fine. I'll probably end up buying some stuff from there sooner or later. Psusennes doesn't need to get bent out of shape over something like those cartouche papyri, because they're just for fun. If someone really wants to learn hieroglyphs, that's hardly the place a logical person would start, anyway. Psusennes doesn't need to get bent out of shape over something like those cartouche papyri, because they're just for fun. You're right, of course. Now that I reread the title of Psusennes's original post ("Oooh! A complaint! "), I should have recognized that it was simply in jest. I pledge henceforth to chill out, take a pill, lighten up, and all that stuff. The actual cartouches in the text are even stranger- I haven't been able to match them to any Pharaoh's cartouches. That's partly because I can't be bothered, but they are most certainly not Seti I's cartouches. It still looks quite nice though. Maybe I'll buy something from the shop as a gift for some of my friends.